Zucchini Soup. Packed with flavor, this is a dairy-free recipe that Inge Teasley shared with me. Silky Gingered Zucchini Soup Makes 4 to 6 servings. Garnish: chopped chives or finely chopped tops of green onions. Heat coconut oil in a large soup pot on medium heat, 2 minutes. 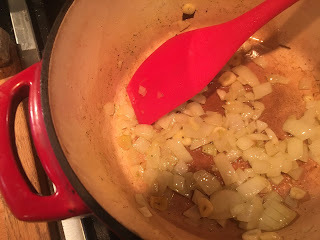 Add onions and garlic to the pot. Stir often and cook until soft and golden but not browned; about 5 minutes. Add the ginger, coriander, salt and pepper to the pot. Stir to combine and when the spices are fragrant, toss in the zucchini. Stir to coat the zucchini with fat, about 1 minute. Add the broth, bring to a boil, cover and reduce to simmer. Let the zucchini cook 45 to 60 minutes until it's very soft. Very carefully, purée the zucchini and broth in a blender or food processor, or with an immersion blender. If you’re using a blender, work in batches, filling the canister only halfway and holding a towel over the lid while you purée. Ladle into bowls and garnish with chopped chives or green onion tops if desired.